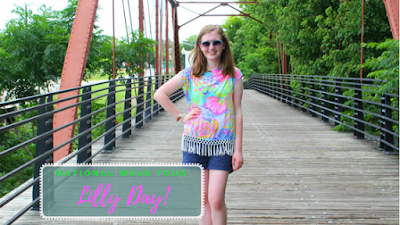 Life as Pink Einstein | Dallas Fashion and Lifestyle Blogger: National Wear Your Lilly Day! Last Wednesday was an eventful day! I got my license, it was the first day of summer, and it was National Wear Your Lilly Day! 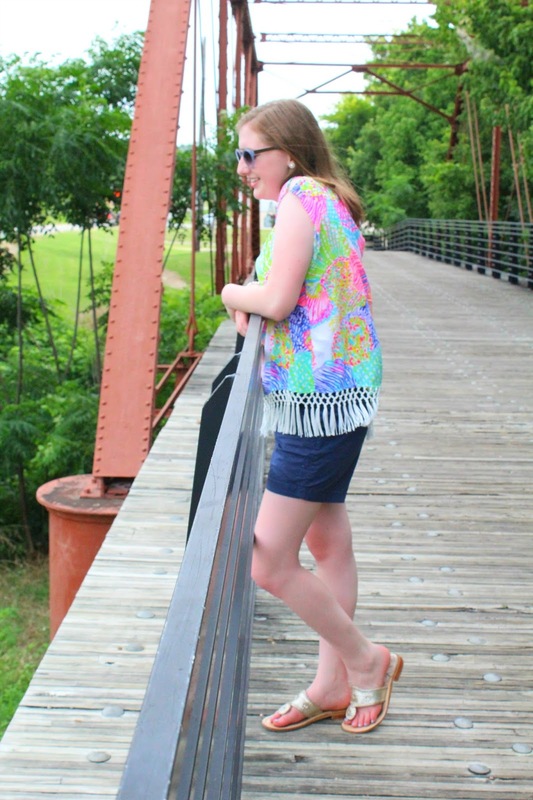 So after my drivers test, my friends and I went to this really cool bridge to take some fun photos. You should have seen my back seat! There was no room left once I loaded up all of the props. We brought some fun outfits, a flag, a beach ball, and all of my camera equipment. 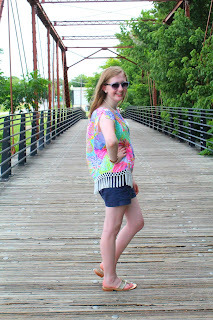 The only part I didn't love about taking these photos was how hot it was outside! With every outfit change I struggled to get into the next outfit due to how hot is was. 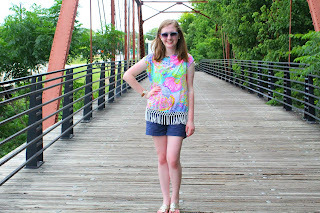 So if you don't know what this holiday is, it is a day that Lilly Pulitzer created a while back on the first day of summer because it's Lilly's favorite season to celebrate their colorful clothing. It was so fun seeing everyone's bright and fun outfits on social media that day. So I am going to be sharing my Lilly outfit from Wear Your Lilly Day! I didn't take a ton of pictures in this outfit because it was starting to get really hot and my friends and I were there mainly to take pictures for a company Sarah and I are repping for so I asked McCray if she could take a few in this outfit before we left. 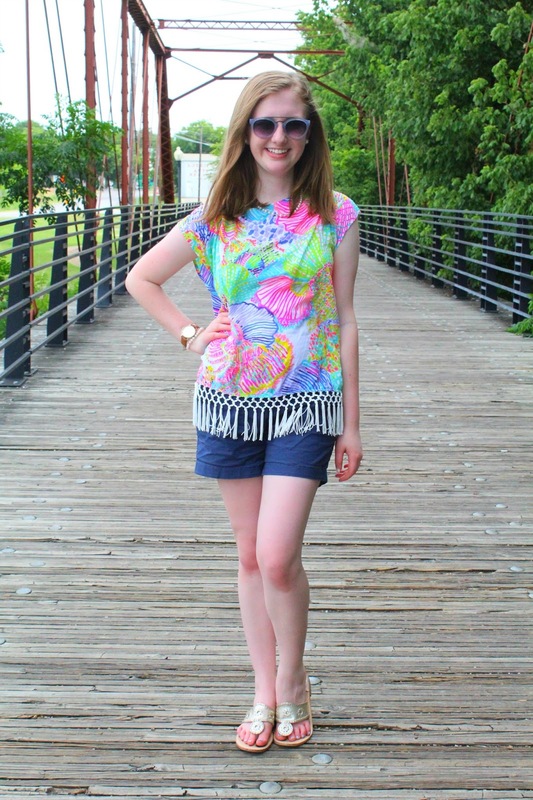 My top is the Lilly Pulitzer Jasmine Caftan in the print Roar of the Seas. 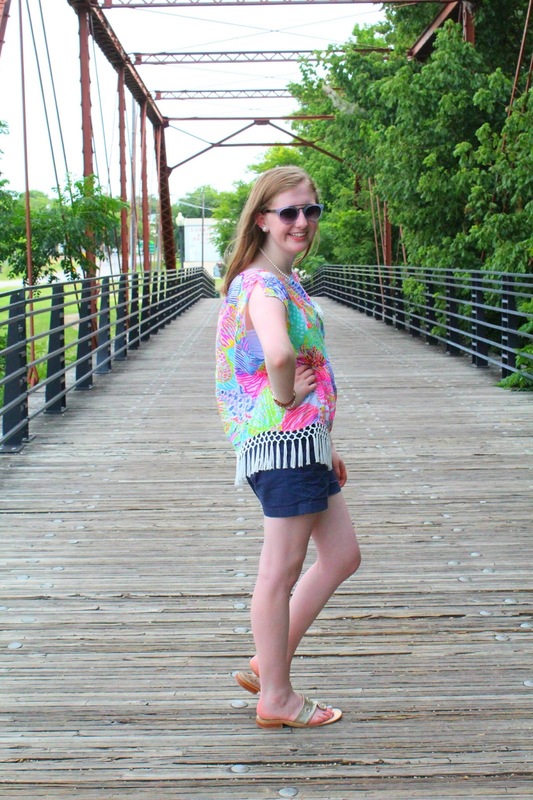 They no longer sell this print but I purchased this top at TJ Maxx on sale for a fabulous price! 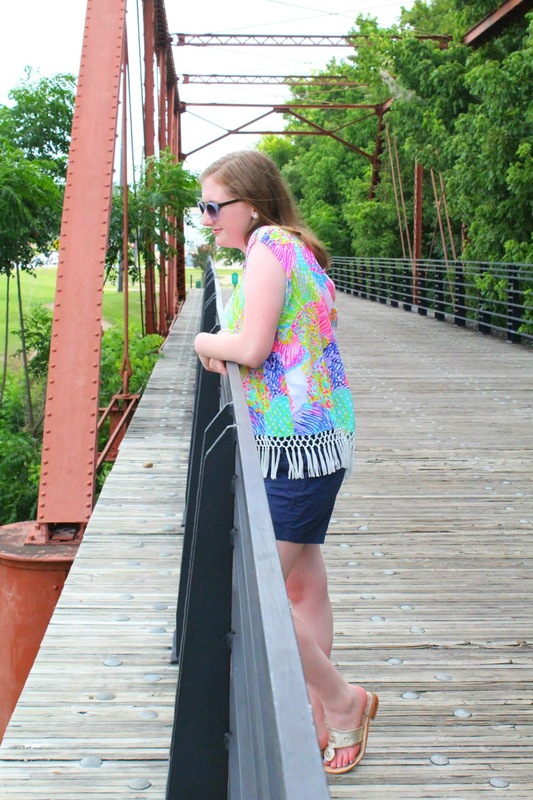 I featured this top in my TJ Maxx Dressing Room Try On and I have an OOTD post featuring Lilly pants in the Roar of the Seas print. In this picture I was trying to show the slit in the sleeve but it didn't work to well. The sleeve is only sewn at the top and has a split giving it a little more personality. The bottom of this top has pretty white fringe. For shorts I wore my new favorite Old Navy navy 5" chino shorts that I got on sale for $16 but are now on sale for $10! For shoes I wore my platinum Jack Rogers. For accessories I wore my fresh water pearl necklace and bracelet and my pearl earrings with the silver detailing. Sarah and I were there to take pictures for the company Southern Girl Prep which we are now repping for! I thought I would throw this outfit in here because I did wear it (for about ten minutes) on Lilly day. 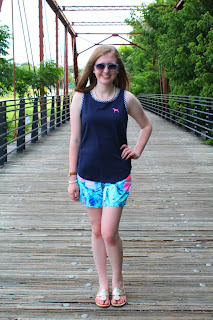 This navy tank with the gingham trim is from SG Prep and I paired it with my Lilly Callahan shorts in the print Hey Bay Bay and my Jacks. Did you celebrate Lilly Day? If so, what did you wear?